Welcome to the Palace of the Governors! 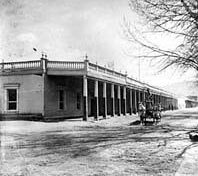 Originally constructed in the early 17th century as Spain's seat of government for what is today the American Southwest, the Palace of the Governors chronicles the history of Santa Fe, as well as New Mexico and the region. This adobe structure, now the state's history museum, was designated a Registered National Historic Landmark in 1960 and an American Treasure in 1999. Contact Rene Harris at (505) 476-5087 to make a group reservation. Group reservations must be made at least 2 weeks in advance. Free Docent Tours call (505) 476-5100 or (505) 476-5200 for schedule and times. Self-guided visits to the Palace of the Governors and/or New Mexico History Museum are available daily. There also may be special self-guided activities. Please ask the front desk when you arrive. To schedule a self-guided tour please call (505) 476-5087 or email rene.harris@state.nm.us. Meet at the Blue Gate on Lincoln Ave. Contains bultos, retablos, and crucifijos, dating from the late 1700s to 1900, demonstrating how European traditions and iconography combined with new palettes, different styles, and regional designs to transform New Mexican santo making into a unique artform. Copyright © 2002-2009, Palace of the Governors, a Division of the Department of Cultural Affairs. All Rights Reserved.